London, the beautiful capital city of United Kingdom invites visitors from across the world. Known as the City of Big Ben, London is home to big gems, modern and historic at every corner. If you wish to see the Thames city of London, get your flights booked here at Rehlat. Save more on your London flight booking with our exciting offers and cashback. Book for roundtrip London flights and save more than one-way journey. The first tournament of Premier League was in 1992, and since then, a total of 47 clubs have played. The only clubs that have been there since the inception are Arsenal, Chelsea, Everton, Liverpool, Man Utd, and Spurs. The most successful team has been Manchester United who were the first winners of the competition, finishing 10 points clear of Aston Villa, and have been the league champions on 13 occasions in total. Travel to London to catch the action live & soak in the excitement of frenzy crowd. London is a most diverse and exciting city that attract visitors from all corners of the planet. Being the proud capital of England, London is home to some of the world's best tourist attractions including London Eye, Tower of London, St Paul's Cathedral, Buckingham Palace, and Westminster Abbey. London isn't only a top tourist destination in the world, but also a best shopping hub that offers everything from clothing to accessories, perfumes to souvenirs. The British capital is filled with world class shopping malls including Westfield London, One New Change, Westfield Stratford City, The Brunswick, Burlington Arcade, and Whiteleys. London is one of the greatest dining capitals in the world that offers wide range of traditional English feast to the regional cooking of countries from Italy to UAE and Mediterranean to India. The historical capital is filled with several hundreds of restaurants including The Ledbury, Chettinad Restaurant, Amaya, Brasserie Zedel, and Gokyuzu Restaurant. London has an exceptional nightlife with pubs, jazz venues, live music, rooftop lounges and comedy clubs. The British capital is one of the easy going cities in the world with a diverse culture and lifestyle. London is home to countless night pubs like Ministry of Sound, Notting Hill Arts Club, Cafe de Paris, Mahiki, Studio 338 and Bethnal Green Working Men's Club. London boasts one of the largest public transportation networks in the world. It is well connected with various modes of local transportation including underground trains, buses, rail, metro, tour buses, private taxis and many more. London buses offer easy and convenient way to travel across the city at an affordable cost. Heathrow Airport is one of the major international airport in London; operates domestic and international flights to all major destinations. It is the third busiest airport in the world in terms of international arrivals. Heathrow Airport served more than 75 million travelers in 2016. It is located just 14 miles (23 km) from west of Central London. Heathrow International airport is a main hub for British Airways. Terminal 2: The Queens Terminal is used by all Star Alliance operators Aer Lingus, German wings and Icelandair. T2 can handle more than 8 million visitors every year. Terminal 3: T3 is used by 18 major airlines, operating long-haul flights to all across the world. Terminal 4: Open in 1986, T4 is used for long-haul and European destination. It handles more than 11 million passengers annually. Terminal 5: Terminal 5 is used by British Airways and Iberia, which handles more than 25 million passengers every year. 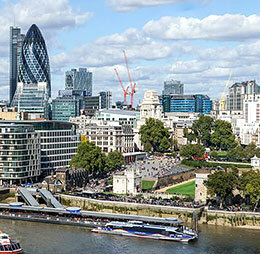 London boasts of several budget hotels and has many state-of-the-art 5-star luxury hotels that offer an engaging environment and exceptional culinary experiences to their guests. Apart from a host of contemporary amenities like fitness centers, Wi-Fi, bed and breakfast benefits, most of the London Hotels have world-class hospitality combined with scenic outside views to delight the guests.